Hi foodies, Welcome to AYESHA'S KITCHEN. 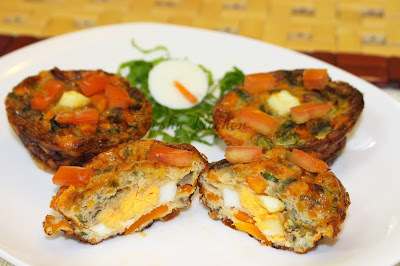 Here i comes with a spicy upside down muffins with egg. Every one loves cupcakes and if it is an upside down muffin, we will surely crave for more. I always prefer baking a whole cake instead of mini cupcakes but pineapple upside down muffin is my all time favorite. Egg upside down muffins are a spicy snack using hard boiled egg, whisked egg and some veggies with spices that makes this muffin an excellent tea time snack. Kids will love this for sure as it looks colorful and just wow!.. Try this healthy quick muffins at home and make your evening yummy. A simple quick spicy cupcake snack for kids lunch box. 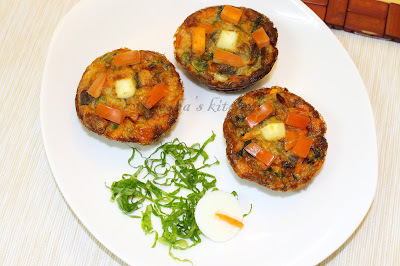 The sauteed veggies are mixed with whisked egg and then distributed it over the sliced hard boiled egg in a muffin tray and then bake for 10 minutes. Simple and healthy. Here is the Recipe with detailed pics. Enjoy cooking.!! In a large pan over medium heat add 1 tbsp of melted butter and saute onion, minced garlic, beans, carrot, spinach, pepper powder, chili powder and salt for 2 minutes. Then add tomato, toss well and remove from flame. Whisk eggs in a big bowl and add the sauteed vegetables to it. Grease the cupcake trays with butter. Slice thinly the hard boiled eggs and set aside along with few small carrot cubes. Now add butter pieces in the muffin tray and above which place the carrot cubes. Like as in the pic. Then place the egg slice and finally distribute the egg batter in each cups. Pour only 95% of the cups. Top it with small boiled egg chops. Keep it in the preheated oven and bake for 10 minutes at 150 degree C.
When done let it rest for 5 minutes and flip to a tray.